STOCKTON, CALIFORNIA (May 21, 2017) - Tracy's Jeff Bischofberger became the third first-time winner in three 2017 Pacific Challenge Series presented by PenneyLawyers.com races, claiming the first Tri-Holiday race of the year at Stockton 99 Speedway. Saturday night's 100 lap contest came down to a 10 lap shootout between Bischofberger and Jason Romero with four career series wins. Romero took over the lead from 2012 and 2016 PCS champion Jeremy Doss of Upperlake, CA on lap 62 when Doss slowed with a broken third link. Doss also set fast time with a blistering 13.140 second lap earlier in Sunoco Fuels Fast Time qualifying. A five car battle for fourth boiled over down the backstretch when Shasta winner Derek Copeland was bounced out of the battle and spun to a stop. That caution appeared to set up what would be a great battle between Romero and 2015 Rookie of the Year Cole Moore, who was searching for his first career PCS win as well. Two attempts at a restart were unsuccessful, with officials electing to move Romero and Moore back a row to set a new front row of Bischofberger and early race leader Ross Strmiska of Manteca. Bischofberger quickly charged ahead of Strmiska into turn one of the restart with Romero following into second position. Romero dove inside Bischofberger several times including a big maneuver coming to the white flag in turn four that did not net the lead position. Romero gave it one more shot in turn four coming to the checkered flag, eventually sliding and bouncing off of Bischofberger. 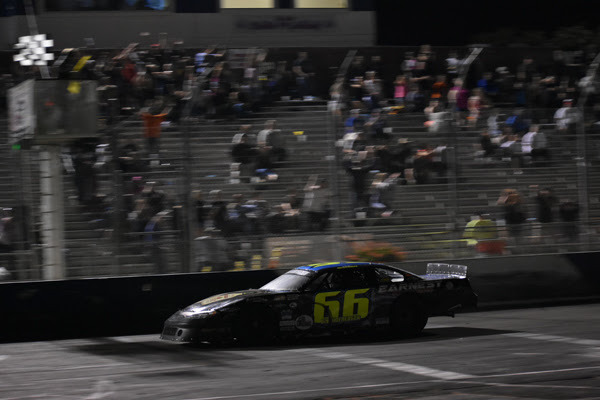 Bischofberger drove through to take the checkered flag first with Moore snaking through for second while Romero crossed the line sideways in third. Romero ended up against the turn one wall after the wild slide with 2014 PCS champion Mike Beeler of Modesto fourth and 2015 PCS champion John Moore rounding out the top-five. Strmiska jumped out to the race's early lead with Beeler a focal point for much of the early battling when he got pinned outside. Moore moved inside Strmiska for the lead on lap 20 and cleared him on the following lap. Doss wasted little time chasing down Moore when he overtook Strmiska on lap 26 for second. A lap 27 caution allowed Romero to get around Beeler for third. Bischofberger was the next driver to get on the move as he was up to fourth by lap 37. Romero's run to the front continued when he took over second place from Moore on lap 47. Romero clawed at Doss before a caution when Matt Wendt and Strmiska made contact that resulted in Wendt stopping in turn four on lap 59. Wendt was able to return after repairs. Doss' days at the lead appeared numbered as Romero looked inside several times before finally getting the move done right as Doss faltered and stopped in turn two with mechanical problems to cause a lap 61 caution. Cole Moore won the American Racer Tire Dash for a set of tires and the pole for the feature. Hayward's Danny Malfatti drove to seventh to win the Penney Racing Supply Hard Charger for his best career Stockton finish. Wendt overcame the early incident with Strmiska for his second consecutive sixth place finish. The Pacific Challenge Series presented by PenneyLawyers.com will continue on June 17th at All American Speedway in Roseville, CA.